If you're one of those folk who miss the physical buttons from the days of yore, researchers from Technische Universität Berlin in Germany has created a gel-filled touchscreen prototype that can form soft buttons of any shape or size from just a your touch. The researchers are calling the 7-inch prototype GelTouch, with a layer of this gel sitting on top of a conductive film and touchscreen. The gel remains fluid in room temperature, but hardens up when it is warmed to form the button. It works with the conducive film, which carries electrical currents in a pattern, so that when your finger sits atop a section of the screen, it heats up and the gel forms a button in the shape of the pattern underneath. The prototype includes a number of button layouts, including a grid form, a slider and even a joystick-like button. 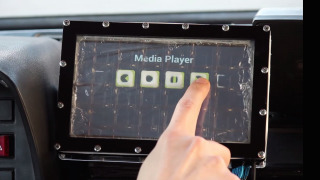 While GelTouch is still a prototype, researchers believe that it could be used in a variety of different settings, including in cars, where the buttons on a touchscreen would allow user's to make selections through touch rather than having to look at the screen, like in the image above. You can check out the researcher's video over here for more details on how the tech works.